On a very warm Friday, September 30, 2011, the Clinton Presidential Park Bridge was dedicated. This completed the eastern loop of the Arkansas River Trail as well as created another feature in Clinton Presidential Park. The ceremony featured remarks by both President Bill Clinton and the incumbent Secretary of State Hillary Rodham Clinton. Chelsea Clinton also took part in the ceremony. Former US Senators (and Arkansas Governors) Dale Bumpers and David Pryor were in attendance as was Jim Guy Tucker who followed Clinton into the Arkansas Governor’s Office. Current Governor Mike Beebe was also present and took part in the ceremony, which was emceed by Stephanie Streett, executive director of the Clinton Foundation. Many other former and current elected officials were present. In addition to dedicating the bridge, the ceremony officially dedicated the William E. “Bill” Clark Presidential Wetlands which are adjacent to the bridge. City Director Dean Kumpuris joined Clark’s widow, Margaret, and son, William, in the dedication of the wetlands. This Clinton Presidential Park Bridge is over 2,600 ft. long. It was constructed in 1899 as the Rock Island Bridge. After the Rock Island stopped using the bridge, the lift span was permanently raised. It had to stay this was for the Clinton redevelopment. Therefore a new surface was built that slopingly takes persons from park level up to the span level and back down. The bridge’s “rusty” structure is complemented by a well-lit 12-18-foot walkway flanked on both sides by silver galvanized steel handrails. The total investment for this area is over $13.5 million. Later that weekend, the Clinton Foundation hosted an event to commemorate the 20th anniversary of Clinton’s announcement that he was seeking the Presidency. Today marks the Chinese New Year (sometimes called Lunar New Year). As part of the twelve year cycle, this is the Year of the Dog. To mark this occasion, here are four sculptures found in Little Rock which feature dogs. Two are in the Vogel Schwartz Sculpture Garden, one is in the Bill Clark Wetlands, and the other is at the Little Rock Animal Village. Forever Ready is based off my 30 years experiences with and my love of the Lab. The sculpture was created during the absence of a lab in my life, this was important, because I wanted to reflect on all the past labs, not a present companion. So, ‘Forever Ready’ is that reflection of the breed (hunter, companion and teacher)…Capturing its intense nature with discipline and loyalty, I have set the lab on edge so intense, that if not given the command to go, it will just fall off. But, it is able to maintain balance – wet and ready to go again. The lab’s shadow is cast in the water below, for a I cannot think of a lab without water. The sculpture was donated by longtime Kumpuris family friend Margaret Clark. She and her late husband Bill were two of the earliest supporters of sculpture along the Arkansas River. They donated another piece in honor of their grandchildren. A sculpture in memory of Bill was unveiled last year and stands in the wetlands park which bears his name. The Bill Clark Wetlands is actually the location of the third dog. It is Chloe, Bill Clark’s faithful hunting dog. She and Bill are part of Clay Enoch’s sculpture STEADY. Dedicated in 2011, it was a tribute to the man who helped build the Clinton Presidential Library. 14 years ago today the groundbreaking for the Clinton Library took place on December 5, 2001. It was dry and about thirty degrees warmer than the actual opening would be in November 2004. The former president was joined by then-Mayor Jim Dailey, City Director Dean Kumpuris, then-Assistant City Manager Bruce Moore, contractor Bill Clark, then-Clinton Foundation executives Skip Rutherford & Stephanie Streett, and other dignitaries in turning the dirt. The location for the ceremony is now actually the parking lot for Sturgis Hall – the home of the Clinton School of Public Service and Clinton Foundation offices. President Clinton was the only member of his family to attend the ceremony, which drew over 400 people. His wife, then the junior Senator from New York, was expecting some important floor votes in Washington DC, and daughter Chelsea was studying in England. At the ceremony, Clinton joked “We’re going to try to build it in less than it took to build the medieval cathedrals and the Egyptian pyramids, but if I can’t rein in my team it may cost as much!” Of course by then the date was set for November 2004. Coordinating schedules of the current and former Presidents is an intricate act. Today is National Dog Day. 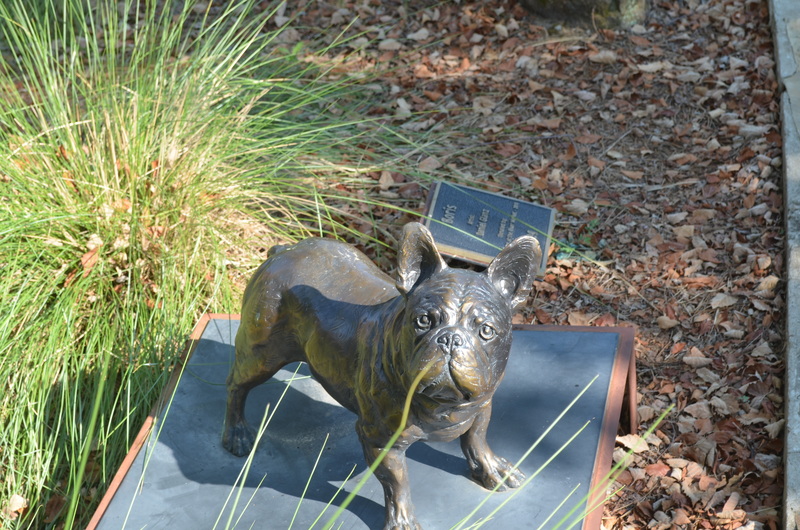 In celebration of that, today we shine the spotlight on two canine sculptures in the Vogel Schwartz Sculpture Garden. First is Dan Glanz’s Boris. 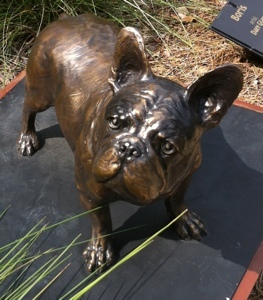 Commissioned in 2010 and unveiled in 2011, this is a likeness of Boris Kumpuris, the dog and companion of Mary and Dr. Dean Kumpuris. A few yards from Boris is Ken Newman’s Forever Ready. It depicts a hunting dog waiting but poised to spring into action. The sculpture was donated by the Sculpture at the River Market committee in 2009. The Sculpture at the River Market Show and Sale continues today. In keeping with that, today’s Sculpture Vulture features a sculpture of an attendee to each of the shows. 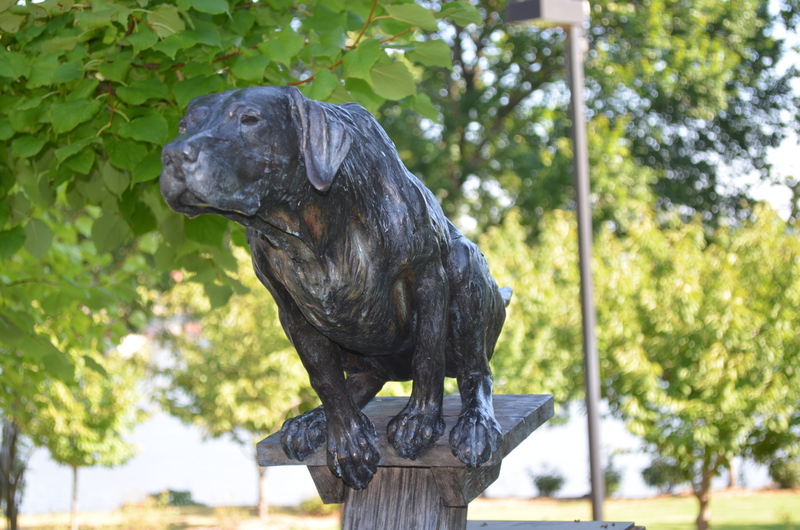 Commissioned in 2010 and unveiled last year, Dan Glanz’s “Boris” is a likeness of Boris Kumpuris, the dog and companion of Mary and Dr. Dean Kumpuris. Little Rock’s newest cultural destination opened last Friday. 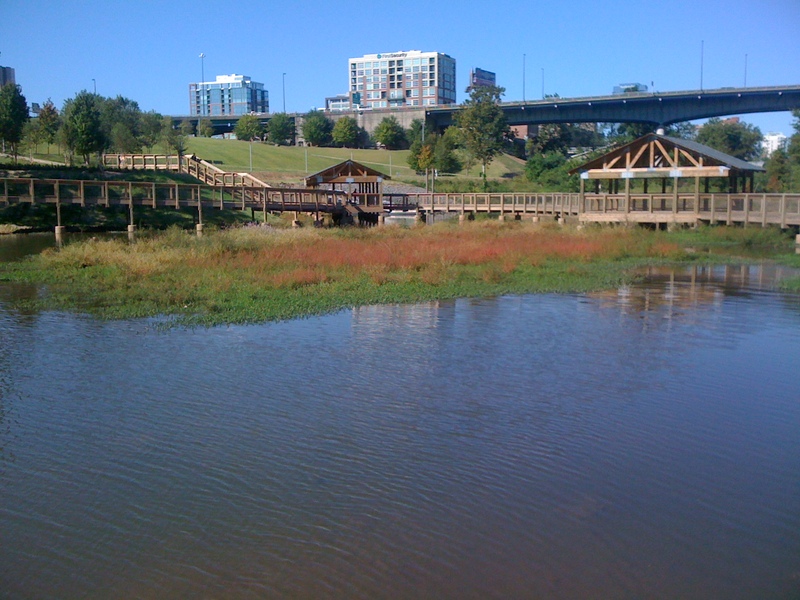 The William E. “Bill” Clark Presidential Park Wetlands is an immersive urban wetland (which sounds like an oxymoron). On the banks of the Arkansas River, the Bill Clark Wetlands allows visitors to meander through nature as well as witness the natural restorative process of water purification. Nestled between two bridges, it is a serene break from the hustle and bustle that surrounds it. It is named in memory of Bill Clark, who was a builder of physical structures as well as character and good causes. A statue of Mr. Clark in hunting attire is placed on the edge of the wetlands. In this statue he is not only looking for birds on a hunt but also at one his projects, the Clinton Library. To the west of the Clark wetlands is another relatively new cultural institution which celebrates nature: the Witt Stephens Jr. Central Arkansas Nature Center, which is a project of the Arkansas Game and Fish Commission. 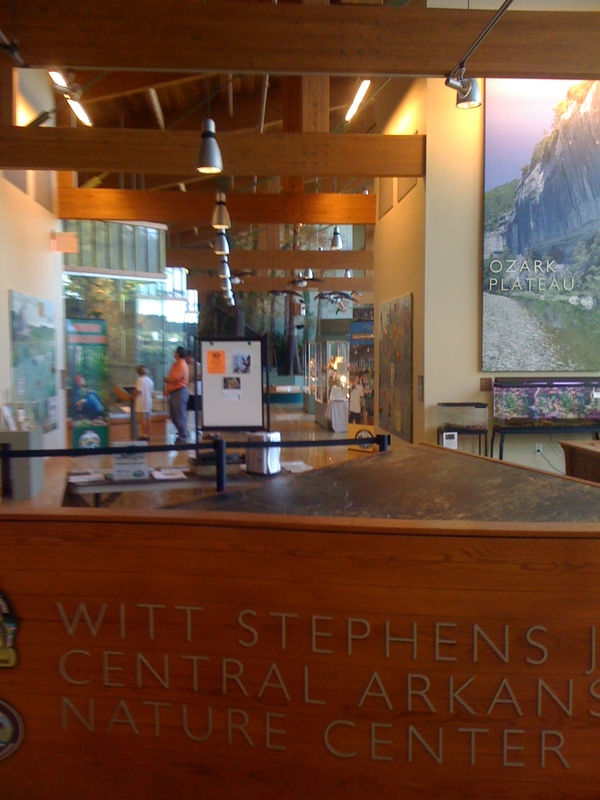 Opened in December 2008 and named in honor of a former G&FC commissioner, this nature center highlights the many outdoor recreational opportunities provided by Arkansas’ fish and wildlife resources provide. There are several interactive exhibits, aquariums, a theatre and educational programs. The Stephens Nature Center is open from 8:30 to 4:30 on Tuesdays through Saturdays and from 1:00 to 5:00 on Sundays. Admission is free; the Center is funded through the 1/8 cent Conservation sales tax.